David hasn't been feeling that great for the past few days, either. I hope he's not sick, too. He went to bed early. So glad that I don't have class or anything today and could sleep. I wasn't very good again about keeping track of this blog...so I've tried to recreate what I remember. Today my sore throat is a little better. I was thinking I would write one paper and study for Wednesday's test, and then on Wednesday I would write the other paper and study for Thursday's test. Guess what! I was wrong and both exams are on Wednesday. Yikes! I wrote my first paper and that took a lot of time. I've been studying as best I could. I've been trying to find energy to put the house back together and clean up the kitchen, but it's been tough. I did have to do some of the dishes so I could bake cookies for my class. I spent a lot of time sleeping today. So far the cold has not been too bad. 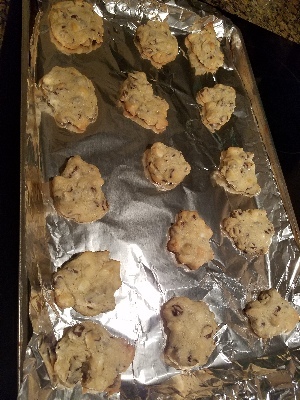 Besides studying, I made chocolate chip cookies for the class for the finals. 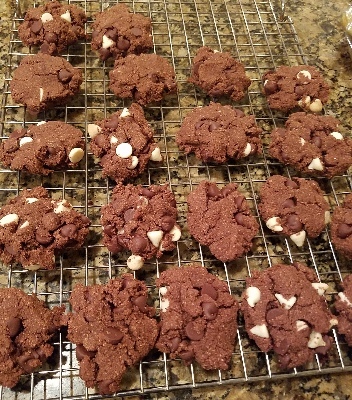 I take the Nestlé's toll house recipe and add more chocolate chips, and also white chocolate chips. They're really delicious. I also started finally cleaning up the kitchen from the party. There are way too many dishes. I had to do some in order to make the cookies. I stayed up pretty late. I tried to go to bed early, but I couldn't sleep. 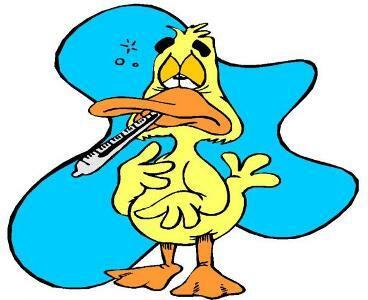 No sore throat today, but I did have a little bit of a fever. 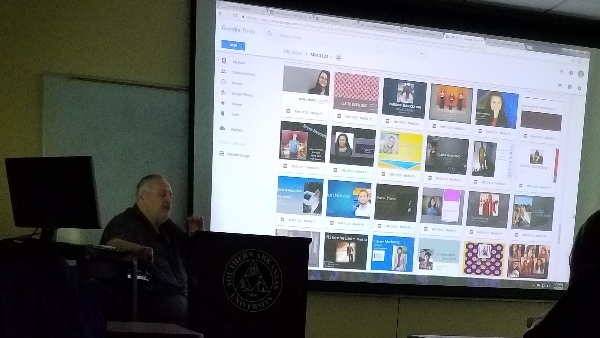 I went in to school. Linda was supposed to come at 9, but she had written the wrong time down, so I had to text her and she came about 9:30. The students enjoyed the cookies! They were all gone by the end of the second final. Of course, students are always hungry and happy to get free food. Some of them were so cute, they said, "Are these home made?" or "You made these?" in awed voices. Both finals were pretty easy. I think the second one was even easier than the first one. I had plenty of time to study and even got lunch in-between the two classes. It rained a bit when I was coming back from class, but I didn't get too wet. I went home after the final... I was hoping to go to sleep, but it took me quite a while. We had a big storm that went on for hours! I had one more paper to write that was due tonight at midnight. It took me a long time, but I finally got it done. It was a lot longer than was required. It was hard for me to be concise because it was all about my experience on the Internet. 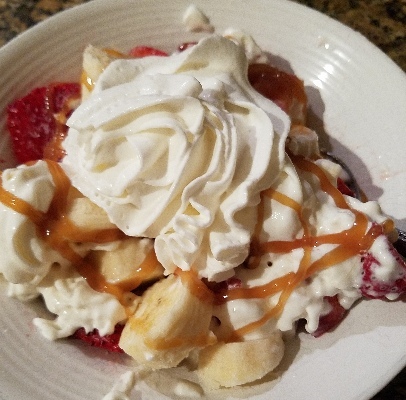 To celebrate being done with finals, I later had a big bowl of strawberries and bananas with caramel sauce and whipped cream. Yum! Today was Star Wars day! May the 4th Be With You. It was nice to be able to sleep in and not worry about school at any more. David was having some tough issues to deal with at work. Poor guy! Being an administrator is so stressful, and he works so many long hours. I mostly worked on my site today and did a little bit of cleaning up. Still recovering from the semester. 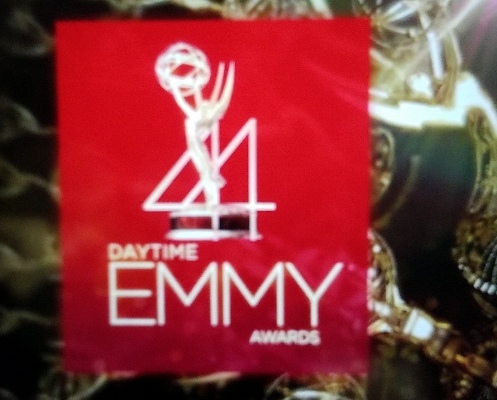 I finally got around to watching the Daytime Emmys that aired on Sunday, so that was fun. I really enjoyed seeing the actors sing in the opening number. That was great. I don't think they've ever done that before. My cold seems to have vanished. I never even went into the coughing stage, so that's great. It was a really mild cold. Yay! Today is Cinco de Mayo! Hope you got to get out and have some fun. David had to go to graduation today. He didn't feel like going out afterwards. I did call the local place, El Compadre, to see if they were open because last weekend we tried going there on Saturday and they were closed. They are open, which is good, but we didn't go. I was in a cooking mood. I made some grilled veggies and also some low carb, gluten-free chocolate chip cookies. I just made them with coconut flour and a little bit of flax seed. They're delicious. 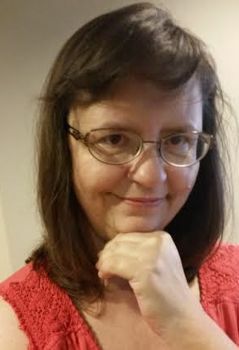 I spent a lot of time the last two days chatting with my friend Kathy. We chat a lot on Facebook Messenger. I also chat quite a bit with my SIL on regular texting. Kathy's in Hawaii, so our hours coincide pretty well. By the time I get up late, it's still early where she is. When I go to bed late, it's not too late for her. I took some photos in my backyard. I finally saw a hummingbird at one of the feeders! So that was great. Also, one of my plants, a plumeria, is sprouting some leaves! 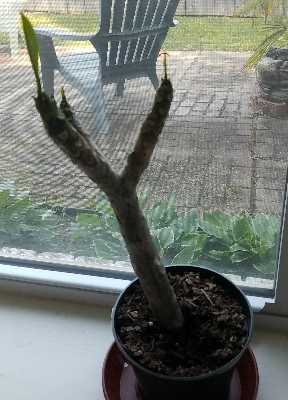 It came with leaves, last Fall, and then they all fell off, so I thought it had died. Then I read online that it goes dormant, so I kept it and watered it occasional. So it's coming back! Yay! Maybe I'll get some beautiful plumeria flowers. We were watching some of the Padres game. I got David a baseball package for an early birthday present, so he can watch them online or on our TV with Roku. Looks like my SIL Susan is coming out to visit us in late June. She wanted to go somewhere for her birthday, which is 6/24. David's is the day after. We'll have already seen her earlier that month when we visit San Diego. We're not getting a dog now until after she leaves because she's very allergic...she wouldn't be able to stay with us if we had a dog. I think she's going to fly into Shreveport but not sure yet. It'll be fun! So glad this semester and week is over! We went to El Compadre for lunch today. I woke up super early and couldn't go back to sleep. After lunch, I did nap for a long time. I finally tested the food there and it's gluten-free, so that's great. 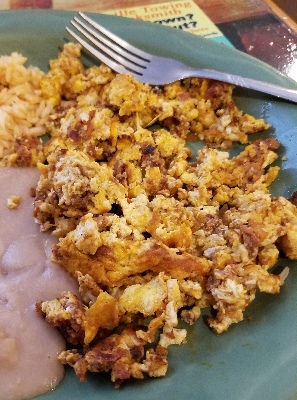 I love their scrambled eggs with chorizo. I'm so annoyed because I was typing this up and got mostly caught up, and I stupidly forgot to save it as I went, and my laptop froze up (it doesn't usually do that). So I lost everything. ARGH! We went for a walk in the afternoon on the SAU trail. That was fun but tiring as always. We usually see a few people walking their dogs, so I get to pet them. We see all the usual farm animals, too. The baby cows are adorable. It was very hot out, though. We're tentatively planning our trips for this summer. We're probably flying to San Diego in early June, then flying to Vegas for a few days, then flying back to San Diego. There was a possibility that we could go to L.A. first (and then not go to Vegas) for a work thing, but that didn't work out, apparently. My other SIL lives in Vegas so that'll be great, to see her and her husband. 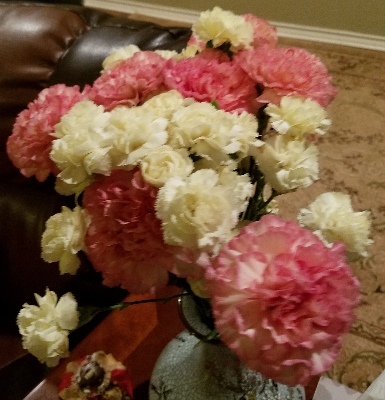 Even though it's been a week, the flowers I bought for the party are still doing pretty well....especially the carnations. I think I forgot to mention last week that I had some weird dreams. I had two very distinct nightmares. In one, I remember that women I knew were visiting us in Hawaii. But they all knew each other way better, and I felt left out...very jealous. Strange dream. I think the other one was post-apocalyptic. I stayed up very late...much too late! 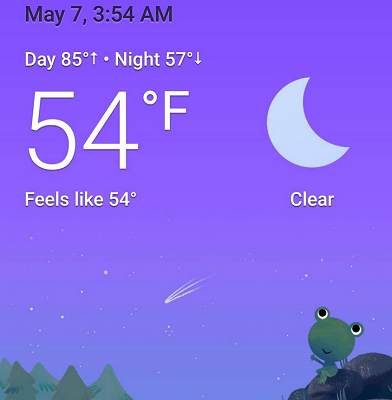 When I went to bed about 3:30 in the morning, it was cold...in the 50's. Then today it was in the 90's. So weird! That's quite a huge leap. We didn't go out for lunch, but later, we did go to the grocery store. I'm very annoyed with my doctor's office. I called in a bunch of prescriptions and two are still not ready. One is the Sudafed I mentioned before. The other is one of my regular allergy drugs. I called on Friday and they said they'd leave the doctor a message. Yet she still didn't call them in. Grrr! We did our walk again on the SAU trail. It was warmer today, so we went a little later in the evening. I mostly did a lot of work on my site and some work around the house. I finally got all of the dishes done, and the laundry, and I picked up everywhere. I put all of the chairs back where they belonged.